Today, we are presenting Oster TSSTTVMNDG review! There is nothing feels more exciting than having a lower end toaster oven which has almost the same options that you get in higher end models. And the reason this news popped up is because of the existence of tssttvmndg oven from Oster. This oven is enriched with many cooking gifts that you ever wished for. Starting from cooking modes to heating to performance, it is able to impress its users. And as the manufacturer has thought so much for their customer, this oven was meant to be popular among them. Yet, if you are about to know this cool product, this Oster tssttvmndg review will help you with it. So, if you want to find out if the Oster tssttvmndg has what it takes to be your next purchase, then stay with us and continue reading our Oster TSSTTVMNDG review! 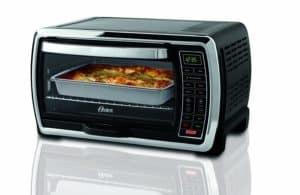 Also, if you want, make sure that you check out our ultimate convection ovens reviews. Obviously, we will start with the features of this interesting oven. Trust us, there’s a lot to talk about here in the features arena. Even being a toaster oven, The Oster TSSTTVMNDG has convection mode as well. And it is pretty surprising to get such toaster oven with convection setting in the pocket-friendly price range. However, this mode lets you cook the yummiest dishes faster and evenly since it got this fan to blow hot air all over the food. And you must remember the fact that you can use the fan for convection bake cooking only. So you cannot turn the convection mode on for other types of cooking. But you have the option of adjusting the temperature. The best thing about the oven is its silent fan. While other fans are likely to make noise and irritate you, the Oster fan won’t do that. So you can call it one of the reasons to get an Oster tssttvmndg review on it. You can call it one the reasons to come up with an Oster TSSTTVMNDG review. This model comes with 4 heating elements: 2 on the top and 2 on the bottom. These elements of the Oster work via turn on and off feature for maintaining the temperature that you set. However, the use of elements completely depend on the picked cooking function, hence every element will not heat up when in use. It’s like if you plan to bake a cake, you go for Bake function, this will make both the top and bottom elements to heat up. And if you want to broil a hamburger and select the Broil mode, it will make the top element to heat up. And this is how the heating elements of the oven work. As for the temperature range of the oven, it ranges between 200°F to 450°F for baking and cooking, and 150°F for Warm. Well, this might be the first or second thing that comes to your mind when you look for an oven. You might get delighted to know that this oven has got generous room to accommodate larger meals for the family. If your stomach is craving for a pizza, bake a 12 inch sized pizza in it. if your kids are shouting for some snacks, toast 6 slices of sandwiches at once for them. Besides, you will also appreciate the tasty bagel that it cooks. But when it comes to chicken, well it might fit a whole small chicken, and if the fowl is larger, then better cut them in half. However, there is little disappointment found regarding the toaster which its size of the oven. You might find the toaster too large for the size of the toaster. Hence it might take up a good room in your kitchen. But yet as for its performance, it does not fail to please you. 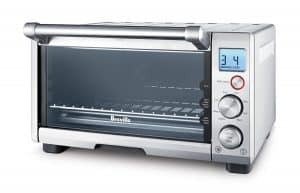 You are gonna get a variety of cooking controls in this toaster oven So yeah it only doesn’t limit itself to just toasting. When you get the glance at the controls, it might remind you of the microwave oven. It has a touchpad where you have to poke for making choices starting from cooking modes such as bake, toast, broil, warm, convection bake, pizza, defrost to cooking time and temperature. The most interesting one among the cooking modes is the Defrost one. And the best thing is that it amazingly convinces to melt any frozen food to give it a warm touch. And since the oven does a lot of work more than you think, it deserved to be highlighted in this Oster tssttvmndg review. 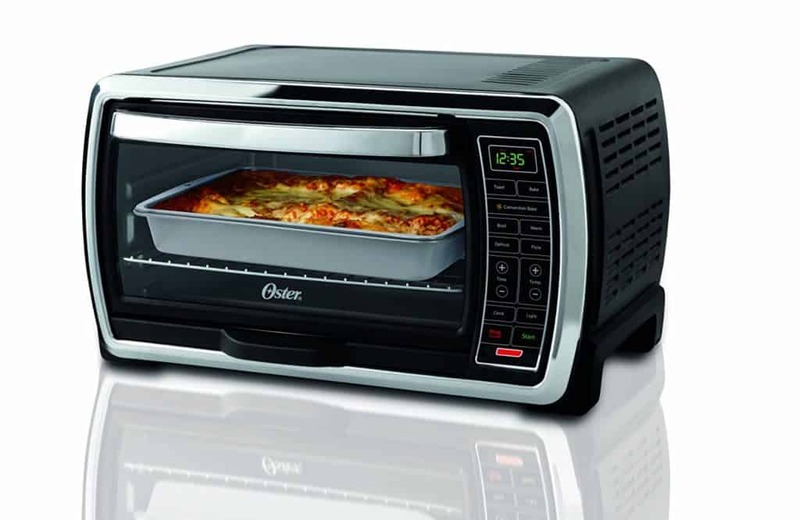 Also, we have reviewed Oster (TSSTTVMNDG & TSSTTVDGXL-SHP) in our best convection ovens reviews. The oven certainly has interior light for providing more convenience. The control panel does it all. it is easy to use and works quickly. The oven is not loud at all. 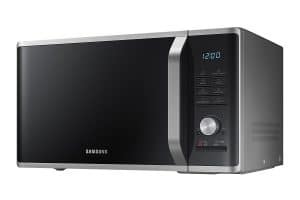 It cooks super-fast using 30 percent to 50 percent lesser time than the regular and boring one. It cooks the food evenly and quicker than any other regular ovens. You might not find the toast setting perfect. The oven gets hot outside. There is no auto-eject on the rack so you have to slide out manually. Also Read : Oster TSSTTVRB04 Review! What is the largest pizza in inch you can place in the Oster tssttvmndg? Answer: you can house a 12-inch sized pizza into the oven. Does the oven turn off when you open the door? And does the exterior get hot when in use? Answer: No, the oven does not turn off when you open the door. And the exterior surfaces do get very hot when you use it. Can you put chicken covered with aluminum foil into this oven? Answer: Putting chicken covered with aluminum foil in the unit might cause it to heat up to 500 degrees. For this reason, it is not recommended to use foil in the toaster oven. Does the oven rack slide out after opening the door? Answer: No, the rack isn’t connected to the door. So you have to slide the rack out manually. There you go. How was the Oster TSSTTVMNDG review? Although the oven might fail to impress you with it toasting function. But, if you think about the other modes, it pretty much succeeds to cover up the fault. However, looking at the performance it gives for providing the delicious warm food, this oven is indeed a great piece to have. So, regarding the features of the product, we hope this Oster tssttvmndg review has helped you enough.